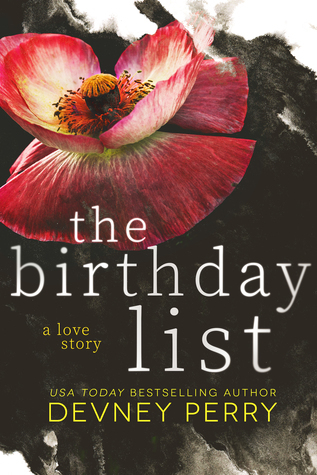 The Birthday List was a quick and satisfying read for me. I enjoyed it, but not as much as I had hoped to. I liked the premise that the story had and the plot but the characters were a huge miss for me. My main issues, character wise, was Cole. Cole seemed like an arrogant jerk the first 50% of the book which in turn didn’t attract me to him. His demeanor was just all wrong for me. His vibe. Had I not had his POV though, I think I would have felt differently. The first half of the book he was unappealing and I didn’t care for his and Poppy’s interactions in the least bit. It was all just…awkward. I think I felt like that because I never felt their connection. It was kind of just, thrown in our face. “Here is a guy! Here is a girl! They are going to like each other!” Forced. Not for me. Another set of characters that didn’t jive with me were Finn and Molly. I felt like the author brought them to light more in times when they shouldn’t of been. This wasn’t their story. It was Poppy’s, right? But a lot of the book felt like that is what it was, their story. And if that was the case, I would have just been happy with their story. I think that is why I couldn’t get into Poppy and Cole. The author gave us so much of Finn and Molly that I ultimately wanted them in the end. I focused on them way more than I did Poppy and Cole. I did like the mix of mystery and connections that the story had. The writing was nice and the little twists added here and there were a nice touch as well. I really feel like, as a reader, if you can’t connect with the main characters you are in for a huge miss but since this book had a strong story line and was hugely plot driven, I didn’t feel like it was a huge miss for me.